With a 2-up invitations format you can make two cards or invites out of one piece of paper. The standard size of paper is 8 1/2" by 11". With a 2-up format you will fit two standard sized cards or invitations onto a page making it more cost effective and much easier to do it yourself! 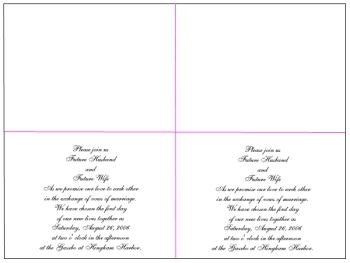 After cutting and folding, the invitations made form a standard size of paper (2-up) will be the size of a quarter of a page and measure to be about 4 1/4" by 5 1/2". This is also a popular size to buy envelopes in, which will definitely make things more convenient when creating homemade invitations. Should you choose to use this format template you ought to know that the sheet you print them onto will also have to be cut in half in order to make the invite. This is something you can get done quite inexpensively at any copy center or small print shop. Although depending on the quantity of invitations you plan to make, you may want to just cut them yourself to save money. I recommend using a good paper cutter to make the task about 100 times easier and less tedious. Choosing to print 2-up invitations can also be very cost effective since you are actually getting 2 for 1, using your paper much more efficiently! You will print half as many as you need! If you are throwing a smaller party you will not need to get professional cutting or folding services. Just do it yourself! If you want to your invitation to be a bit different you can even set your invitations up to face the long way on the page! Setting up your invites to print multiple per page is something that most can do at home on your own computer using desktop publishing programs or even Microsoft Word. 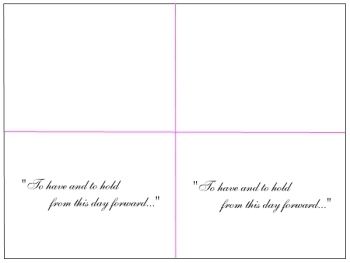 I also have several free templates for you to format and print the text yourself for everything from printing text onto two to a page blank folded and flat cards, to printable invitations complete with graphics and all, to wedding invitations and stationery.